Trump’s false claim was made to support his argument that the U.S. shoulders an increasing amount of the burden for NATO because the country’s GDP is rapidly rising, making its contributions to defense relative to other NATO allies even more unfair. In addition to the GDP claim being wildly off, his entire premise is muddled. For starters, a rising GDP has no effect on how much the country spends on defense. Trump, July 12: Now, the United States, depending on the way you calculate it, was at 4.2 percent and I said, “That’s unfair.” And we have the largest GDP by far, especially since we’ve increased it by so much since a thing called the election. Our GDP has gone way up. And so, the fact that our GDP went way up, that means we’re paying for even more, which is very unfair. 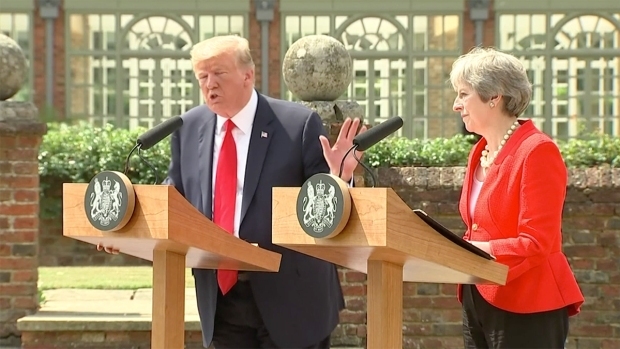 Trump, July 13: And yet the United States pays 4.2 per cent — is the actual number not 3.5 — it’s 4.2 per cent of a much larger GDP. In fact the GDP since I’ve taken over has doubled and tripled. So it’s very you know it’s a very unfair number. There’s a lot of misinformation to unpack here. As we have explained before, Trump regularly conflates NATO’s direct and indirect spending to claim — as he did at the press conference — that the U.S. is “paying for 90% of NATO.” In direct costs, NATO says the U.S. currently pays about 22 percent of NATO’s “principal budgets” that are funded by all alliance members based on a cost-sharing formula that factors in the gross national income of each country. By our calculation, that comes to about $590 million from the U.S., at most. In addition to direct contributions to NATO’s operating budget, NATO members agreed in 2006 to try to spend at least 2 percent of their gross domestic product on their own defense spending. In 2014, they agreed again to aim to meet that standard by 2024. That hasn’t happened, at least not yet. In July, NATO said that only five nations would meet that guideline in 2018: the U.S., Greece, Britain, Estonia and Latvia. The U.S. will spend an estimated 3.57 percent of its GDP on defense this year, according to NATO’s agreed upon definition of defense expenditures, not 4.2 percent as the president said. As we wrote recently, the Bipartisan Budget Act of 2018, a two-year budget agreement that Trump signed into law Feb. 9, set the budget authority for national defense at $700 billion in fiscal year 2018 and $716 billion in fiscal 2019. Defense spending would have had to total about $776 billion in 2017 (and even more in 2018) in order for the U.S. to have spent even 4 percent of its GDP on defense. Trump argued that the inequity of U.S. contributions to NATO had widened since he took office because, “the GDP since I’ve taken over has doubled and tripled.” That’s ridiculously wrong. According to the Bureau of Economic Analysis, the U.S. GDP rose from $18.6 trillion in 2016 to $19.4 trillion in 2017. And it was nearly $20 trillion in the first quarter of this year. So it’s growing, but you’d have to compare the current GDP to the GDP in early 2000 to say it had doubled; and to 1992 to say it had tripled. Even if the president actually meant that the percentage growth of real GDP had doubled or tripled — which is not what he said — he’d still be wrong. As we wrote in our most recent update of Trump’s Numbers, the economy increased by 2.3 percent during Trump’s first full year, better than the 1.5 percent real GDP growth posted in 2016. But the GDP growth historically fluctuates by year: The four best years under Obama, for example, were 2.9 percent real growthin 2015, 2.6 percent in 2014, 2.2 percent in 2012 and 2.5 percent in 2010. So the percentage growth has not doubled, or tripled, from 2016 to 2017. The economy grew at an annual rate of 2.0 percent during the first three months of this year, according to the most recent official estimate by the Bureau of Economic Analysis. The first official estimate for the second quarter of 2018won’t be released until July 27. However, the“GDP Now” forecastproduced by the Federal Reserve Bank of Atlanta projected on July 11 that the second-quarter growth rate will come in at 3.9 percent. By way of comparison, here’s how the United States’ GDP growth of 2.3 percent in 2017 compared with the next five largest economies in NATO: Germany, 2.2 percent; United Kingdom, 1.8 percent; France, 1.8 percent; Italy, 1.5 percent; and Canada, 3.0 percent. 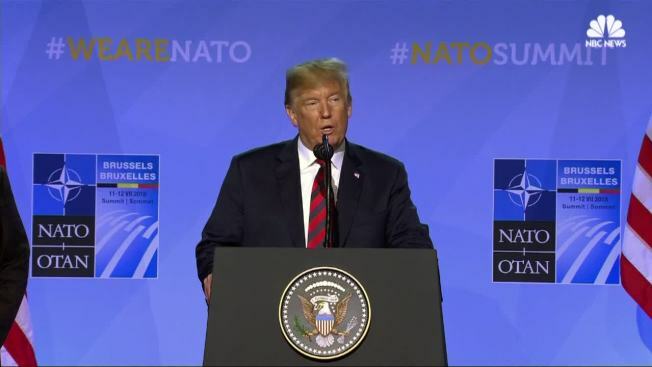 Trump mentioned the GDP in relation to the percentage the country spends on defense, and argued that our growing GDP would increase the inequity between what the U.S. spends on defense relative to other NATO allies. But the defense budget is not tied to the GDP. In fact, if GDP were to rise and defense spending remained the same, the amount the U.S. spends on defense as a percentage of GDP would drop. Since direct contributions to NATO are based on a cost-sharing formula that factors in the gross national income of each country, the United States’ rising GDP could affect its obligation in direct costs to NATO. But a rising GDP wouldn’t increase the percentage of GDP the U.S. spends on its defense.